I’ve entered a phase I think of as “App Fatigue.” I now use my smart phone mainly as, well, a phone. Sure, I take advantage the handy tools like messaging, maps, Internet, weather, music, LinkedIn, etc…, but I can’t recall the last time I crawled around iTunes looking for some new time-saving or world-changing app for my iPhone. I’m just not interested. Fatigue has set in. I love the Waze logos! My one exception: a new traffic app recommended by a work colleague. After a particularly hard day of winter driving and barely contained road rage, I finally downloaded “Waze,” and my life was markedly changed for the better. 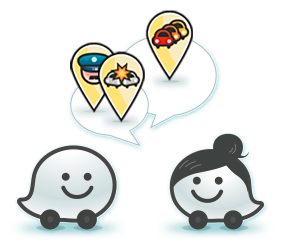 If you haven’t met Waze yet, I guarantee that you’re destined to become best friends. Waze bills itself as “the world’s largest community-based traffic and navigation app.” In my regular commute from Denver to Boulder and back, I can hardly do without it. It’s never wrong on its routes and very close on time estimates. It draws from a sizable community of other drivers using the same tool, so it estimates traffic speed and flow along my routes by using all available sources of information. Aside from the rare glitch, I’ve come to trust its suggestions, and I use it even when I’m only making short hops around town. It’s a real-time, community-sourced app for more than just traffic. We “Wazers” all use the tool to report and share news about accidents, hidden police, inclement weather, or whatever else may be an impending impediment to our safe arrival at our final destination. No longer do we need to have to wait in standstill traffic wondering whether the cause of the jam is one mile, two miles, or ten miles ahead. It’s that good. Finally, I appreciate the marketing. The Waze tag line is “Outsmarting Traffic, Together.” I love that! Succinct and true. Waze is also a true example of gamification. The tool assigns you points for activities like reporting and getting others to join, and you can use your points to customize your icon (mine now has a sword and is a sunflower). It’s a thrill to earn points for helping other drivers. Game on! So, are my friends weary of me talking up this app? Hardly. I’ve actually converted many into fellow Wazers, and they profess to love it as much as I do.